Firefighters secure Notre-Dame Cathedral in Paris on April 16, 2019, in the aftermath of a fire that caused its spire to crash to the ground. 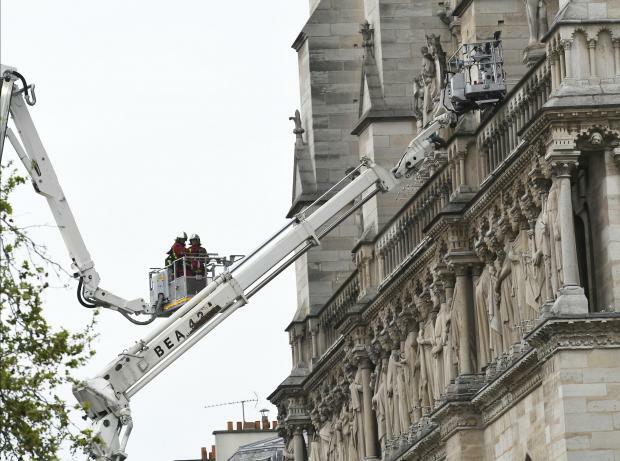 Billionaires and local governments pledged nearly €500 million on Tuesday to help restore Notre Dame cathedral, with foundations and crowd-sourcing sites also launching fund-raising drives. French luxury group Kering, whose brands include Yves Saint Laurent and Gucci, kicked off the campaign late Monday with a promise of 100 million euros. Specialised craftsmen and rare materials are also expected to be needed to restore the monument, which welcomes around 13 million visitors each year -- an average of more than 35,000 people a day. The head of a French lumber company told AFP he would try to gather the 1,300 oak beams he figures are necessary to rebuild the intricate lattice that supported the now-destroyed roof, known as the "Forest". But Sylvain Charlois of the Charlois group said finding big enough logs would not be easy, since "there aren't any stocks of cut wood in France available for a project this big." The United Nations' Paris-based cultural agency UNESCO has promised to stand "at France's side" to restore the site, which it declared a world heritage site in 1991.